Independently owned and operated by husband and wife team Wendy Schick and John Davies. Tumbleweed first started business in Matakana in 2000, relocating to its present site 2 years later, incorporating a full landscape supply depot, with the introduction of a complete landscape service, from landscape design to installation. John and Wendy have a wealth of plant knowledge. John being a 4th generation horticulturist of the New Plymouth based family business ‘Duncan & Davies’- the largest nursery in the southern hemisphere. John completed his apprenticeship under George Rainey at then Rainey’s Nursery before working for Peter Soljan learning every facet of growing citrus. After this time John set up and operated Avondale Garden Centre for seven years before selling to his business partner in 1981 to buy the disused Model Nurseries, bringing it back in to production, supplying most major garden centres and landscapers throughout the North Island. In 1996 the nursery was relocated to Matakana. Wendy started working at Avondale Garden Centre in 1979 before taking up a position at Model Nurseries in 1982, with complete training in plant propagation and nursery work, eventually taking on the roll of sales manager. 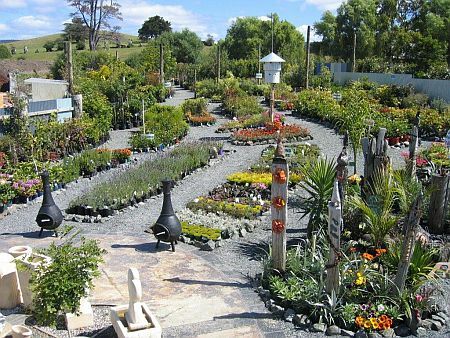 John and Wendy saw a need for a retail outlet in the Matakana area and in 2000 opened Tumbleweed Coastal Plants, operating both businesses for two years before realising the potential for a professional landscaping service. At this time the operation moved to a larger site with a full landscape supply yard / garden centre. Our vision was to have a garden centre that is more like a garden. Plant displays are unstructured and visitors can wander informally among meandering pathways and enjoy the display of original garden sculpture and pots mingling with plants gaining inspiration and ideas along the way. Since the inception of Tumbleweed, the services provided by the company have expanded enormously, from landscaping small house sites, industrial and residential subdivisions and a newly built school. However, our main thrust is to be ‘plant’ orientated & provide our customers/clients with good honest advice.